In the United States, Flag Day is celebrated on June 14. It commemorates the adoption of the flag of the United States, which happened that day by resolution of the Second Continental Congress in 1777. The June 14 date is also when Congress adopted "the American continental army" after reaching a consensus position in the Committee of the Whole. 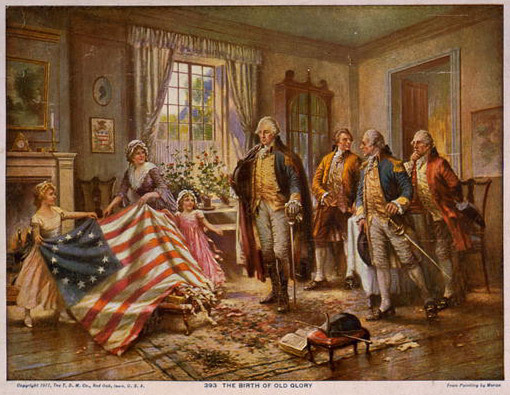 Flag Resolution of June 14, 1777 - stated: "Resolved: that the flag of the United States be made of thirteen stripes, alternate red and white; that the union be thirteen stars, white in a blue field, representing a new Constellation." Act of April 4, 1818 - provided for 13 stripes and one star for each state, to be added to the flag on the 4th of July following the admission of each new state. CREDIT: Ferris, Jean Louis Gerome. "Making the flag." Detroit Publishing Company between 1900 and 1920. Touring Turn-of-the-Century America: Photographs from the Detroit Publishing Company, 1880-1920, Library of Congress. The rattlesnake was the favorite animal emblem of the Americans even before the Revolution. In 1751 Benjamin Franklin's Pennsylvania Gazette carried a bitter article protesting the British practice of sending convicts to America. The author suggested tht the colonists return the favor by shipping "a cargo of rattlesnakes, which could be distributed in St. James Park, Spring Garden, and other places of pleasure, and particularly in the noblemen's gardens." Three years later the same paper printed the picture (as seen above) of a snake as a commentary on the Albany Congress. To remind the delegates of the danger of disunity, the serpent was shown cut to pieces. Each segment is marked with the name of a colony, and the motto "Join or Die" below. Other newspapers took up the snake theme. By 1774 the segments of the snake had grown together, and the motto had been changed to read: "United Now Alive and Free Firm on this Basis Liberty Shall Stand and Thus Supported Ever Bless Our Land Till Time Becomes Eternity"
This was the personal flag of the Commander-In-Chief during the Revolutionary War. A reproduction of this flag flies today at Washington's Headquarters, Valley Forge. Also known as the Continental flag, it is the first true U.S. Flag. It combined the British King's Colours and the thirteen stripes signifying Colonial unity. George Washington liked this design so well that he chose it to be flown to celebrate the formation of the Continental Army on New Years Day, 1776. On that day the Grand Union Flag was proudly raised on Prospect Hill in Somerville, near his headquarters at Cambridge, Massachusetts. The American Revolutionary period was a time of intense but controlled individualism - when self-directing responsible individuals again and again decided for themselves what they should do, and did it- without needing anyone else to give them an assignment or supervise them in carrying it out. Such a person was the patriot Colonel Christopher Gadsden of South Carolina. He had seen and liked a bright yellow banner with a hissing, coiled rattlesnake rising up in the center, and beneath the serpent the same words that appeared on the Striped Rattlesnake Flag - Don't Tread On Me. Colonel Gadsden made a copy of this flag and submitted the design to the Provincial Congress in South Carolina. Commodore Esek Hopkins, commander of the new Continental fleet, carried a similar flag in February, 1776, when his ships put to sea for the first time. Hopkins captured large stores of British cannon and military supplies in the Bahamas. His cruise marked the salt-water baptism of the American Navy, and it saw the first landing of the Corps of Marines, on whose drums the Gadsden symbol was painted. One of the first flags flown by our Navy may have been an adaptation of the "Rebellious Stripes" created at the time of the Stamp Act Congress. It featured thirteen red and white stripes. Stretched across them was the rippling form of a rattlesnake, and the words, "DON'T TREAD ON ME"- a striking indication of the colonists' courage and fierce desire for independence. The flag we know today as the first Navy Jack (sometimes known as the "Culpepper Flag) is believed to have flown aboard the Alfred, flagship of the newly commissioned Continental fleet, in January, 1776. American ships used this flag, or one of its variations, throughout the Revolutionary War.